Security has always been of utmost importance to us here at Simple Source Solutions. Keeping your getsimple.net login details safe is right at the top of the list for us. In addition to a myriad of optimizations enhancements to speed your browsing experience within our client area, you now have the option of enabling two-factor authentication on your getsimple.net account to protect your accounts. Two-factor authentication adds an extra layer of security by adding a second step to logging into your client area at getsimple.net. By taking something you know, such as your password, and adding a second factor, such a device generated code (i.e. on your smartphone), even if an attacker has your password they're prevented from accessing your account. Why is Two-Factor Authentication Needed? Despite advice to the contrary, users don't change passwords often enough and tend to use a "favorite" password for more than one service–making it very easy to compromise. So, two-factor helps provide a solution to this problem by providing a second layer of security. The method we've chosen to impliment employs time-based, 6 digit codes that change every thirty seconds as the second factor to your getsimple.net account password. You simply install Google Authenticator on your iOS or Android Device and visit your getsimple.net account where you can enable the service under Your Greeting > Change Password > Security Settings. You'll be asked to scan a QR code using google authenticator to setup the service. Once setup you can use the app for future access codes. This is a simple solution that provides you with extra security in keeping your private account information private. Does your existing hosting provider give two-factor authentication as an option for added security? Get. Simple. Shared hosting customers of some of the larger web hosting companies out there have started receiving unfriendly notices from their once trusted host. In a nutshell, the notices from JustHost and BlueHost and others state that Joomla 1.5 websites will be automatically updated to Joomla 2.5 in the coming days. Needless to say, this will create all sorts of issues and errors to appear on their customers' websites. Our guess is that this is a security move by these companies out of sheer ignorance. 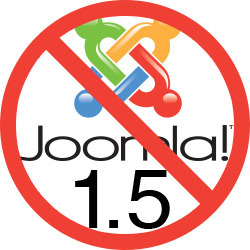 Joomla 1.5.26 does have some security flaws out of the box that do have patches available. Why not just offer to apply the patch...or even ask that the customer apply the patch by a certain date? We're not sure, but instead these hosts have chosen to send, what amounts to, eviction notices to their Joomla 1.5 hosted customers. If it's not being done out of ignorance, then it's ambivalence toward 1.5 users, which would make the move all the more sad. So, if you've received one of these notices, what are your viable options? If you're a soon to be refugee from one of these hosting companies, we would be honored to serve the hosting needs of your Joomla 1.5 website. We've been offering hosting services to our Joomla users since 2007 and have the experience needed to be your reliable and trustworthy hosting partner. We employ a set of stringent security controls that help keep your site running without a hitch and without inconveniencing you as some have chosen as an attempt at security. We proactively maintain all of our servers to ensure optimal performance and monitor services on each service in 5 minute intervals to quickly respond to any issues that may arrise. We're more capable of serving your hosting needs. We can migrate your sites from these providers free of charge and ensure that the latest patches have been applied to your Joomla 1.5 install. Furthermore, when signing up, use promo code: JOOMLA15REFUGEE to automatically receive 20% off of your order. We do a lot of Joomla website updates for our customers and even for people not hosting with us. If you're looking to have your site updated to Joomla 3 or Joomla 2.5, the right way, we can generally get this accomplished for you in as little as a few days to a few weeks for more complicated websites. If you're choosing to host with us, we even give you a significant discount off of our update service. We're sorry you're experiencing the incovenience of this awkwardly forced sitution. Whatever you choose to do, you can rest assured that Simple Source is here to support you in the days ahead.